In a tragic news from the city Chennai, a rare Cuban crocodile died of stress caused by loud music played in a resort nearby. The female crocodile at the Madras Crocodile Bank Trust, Centre for Herpetology died on March 30 after the Sheraton Grand Chennai Resort and Spa held an event recently, where loud music was played the whole night. After the death of the crocodile, the founder of the Madras Crocodile Bank Trust, Romulus Whitaker in his Facebook post blamed the Sheraton Grand Chennai Resort and Spa on social media, stating that the crocodile might have died because of the vibrations of the heavy bass music that was being played at the resort. Also, the vibrations created by the loud music used to cause stress among the animals. Cuban crocodile was a critically endangered species according to the World Conservation Union (IUCN) listing. 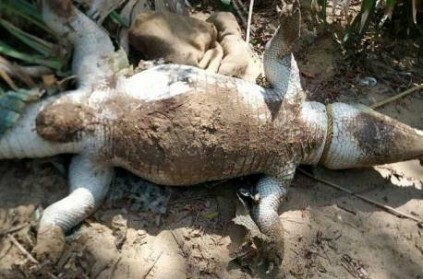 The crocodile bank had five of Cuban crocodiles, out of which one female died on March 30. This page contains news relating to various facts and events. The views are generally about current affiars and general topics in diversified areas such as political, international, national, and regional issues, sports, health, travel, lifestyle, technology and business. People having similar interets on the above topics will find this page useful. Endangered Cuban Crocodile Dies Of Stress and shock After Chennai Hote | Tamil Nadu News.